Welcome to Day 961 of our Wisdom-Trek, and thank you for joining me. for its original recipients and for every believer. If you have never read the visions contained within the book of Ezekiel, it is an unusual and fascinating read. Ezekiel had his vision in Babylon as one of the captive exiles (Ezekiel 1:1-3). 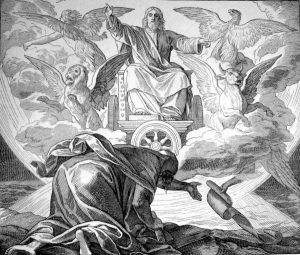 Comparing his vision to Babylonian iconography reveals that Ezekiel saw a divine ‘”throne-chariot” of the heavens, widely described in the ancient biblical world. Just as human kings had chariots, so did deities. It is said that a deity would traverse the heavens in his chariot throne, inspecting his domain and exercising authority over it. 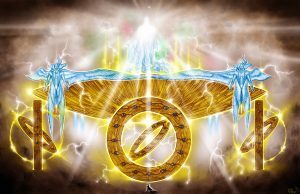 In Ezekiel‘s vision, this throne sits above the surface or expanse in Ezekiel [1:26] which is the same word used in Genesis 1:6-8 for the heavens. Psalms [29:10] and Psalms 150:1 also gives us a snapshot of God’s abode. Back to the divine throne, wheels supported the chariot throne, along with four unusual creatures identified as cherubim in Ezekiel 10:4. Each creature had four faces: human, lion, eagle, and ox (Ezekiel 1:10). Next to each cherub were four gleaming wheels in Ezekiel 1:15-16. These wheels were set on edge, since they are described as “tall” in Ezekiel 1:18. They had wheels within them—that is, each one had at least one concentric circle within it. 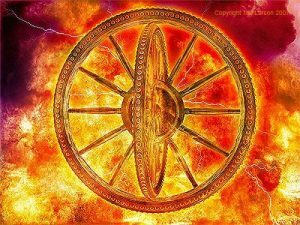 The vision describes the outer edge, or “rim,” of each wheel as having “eyes,” which is translated from the Hebrew word “Ayin.” The prophet Daniel, who was also in Babylon, described the very same blazing throne with wheels Dan 7:9. The four faces of the four animals or cherubim correspond to the iconography of the Babylonian zodiac. Each represents a seasonal constellation in Babylonian astrology, and each face or constellation also represented one of the four directions, North, South, East, and West. This is also referred to as the quadrants of the sky. Babylonians knew that the heavens were connected to what happened on earth such as times, seasons, crops, and weather. The Babylonians believed their gods controlled those functions. Information about the stars was laid out on Mesopotamian astrolabes, which were clay tablets whose concentric circles could well correspond to the “wheels within wheels” imagery. English translations of Ezekiel’s vision often break down at the point where the prophet describes “eyes” on the rims of the wheels. The Hebrew word “Ayin” occurs a number of places throughout Ezekiel’s vision, but it is not always translated the same. At times it is translated as eyes. Taking the NLT as an example, “ayin” occurs six times in chapter 1 in verses 4, 7, 16, 18, 22, 27, but only translated as “eyes” in verse 18. In the vision’s description of the wheels and several other verses, the word “ayin” is translated as “sparkled” such as Ezekiel 10:9. Since ancient astronomical texts commonly describe shining stars as “eyes,” the Hebrew word “ayin” can refer to stars or their sparkling appearance. Many translators miss this possibility, failing to consider the astronomical context portrayed by the four faces. During their time of exile, the Jewish captives might have easily believed Yahweh had abandoned them forever. Likewise, the Babylonians could have simply assumed their gods had defeated Yahweh and ruled the heavens and the earth unchallenged. But Ezekiel s imagery sends a message to the Jews in exile, and to their Babylonian captors: Both assumptions are flawed. Yahweh has not been defeated, nor has He turned away from His people, Israel. He remains seated in His chariot throne at the center of His domain, which is the entire cosmos. When we read Ezekiel 1 through ancient eyes, we can feel the same hope today. Even in the midst of difficult circumstances, we can know that an all-powerful God is active and present in our lives. There is so much imagery in Ezekiel it is overwhelming trying just to picture it, let alone grasp its meaning. 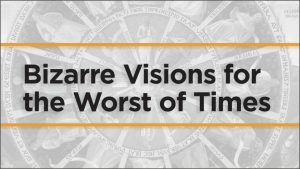 I encourage you to invest time considering the great God who reigns from His throne-chariot. Ezekiel [1:26]-29 is just a glimpse of His splendor. That will conclude our essay for this week. 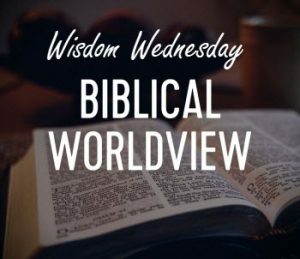 Next Wisdom Wednesday we will continue with the Old Testament as we look at Dr. Heiser’s next essay titled “Answers from the Dead Sea Scrolls” – I believe you will find this another interesting topic to consider as we build our Biblical worldview. Tomorrow we will continue with our 3-minute Humor nugget that will provide you with a bit of cheer which will help you to lighten up and live a rich and satisfying life. 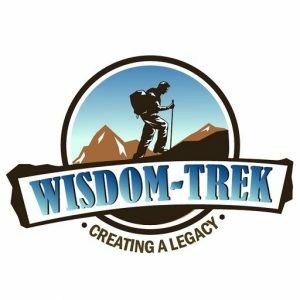 So encourage your friends and family to join us and then come along with us tomorrow for another day of ‘Wisdom-Trek, Creating a Legacy.’ If you would like to listen to any of our past 960 treks or read the Wisdom Journal, they are available at Wisdom-Trek.com. I encourage you to subscribe to Apple Podcast or Google Podcast so that each day’s trek will be downloaded automatically. 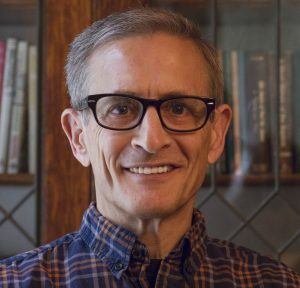 Thank you so much for allowing me to be your guide, mentor and most of all your friend as I serve you in through this Wisdom-Trek podcast and journal. I am Guthrie Chamberlain….reminding you to ’Keep Moving Forward,’ ‘Enjoy your Journey,’ and ‘Create a Great Day…Everyday’! See you Tomorrow!